In this article Marco Panato reviews The Carolingian World by Marios Costambeys, Matthew Innes, and Simon MacLean. 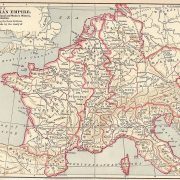 At the height of its power, the Carolingian Empire dominated western Europe as its largest single polity. The Carolingian World, published in 2011, offers a comprehensive survey of the empire from its 8th century origins, to its struggle to maintain unity in the 9th century.